Power USB 5V supply. No external power is required. Physical 120mm x 40mm x 65mm. Print2PC is used in several thousand installations worldwide to migrate high value paper print applications to electronic records. Data from legacy applications that can only print to the parallel port can be captured and reprocessed. A printer attached to a host computer using a parallel or centronics port is replaced by the Print2PC emulator. The are no requirements to change the host application or configuration. 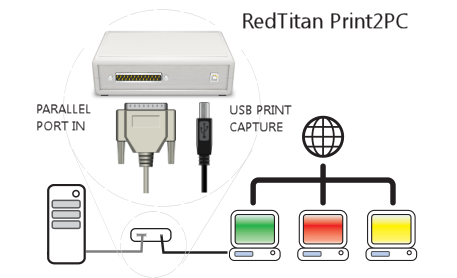 Host application print files are directed by PRINT2PC to RedTitan EscapeE transform software running on a PC connected using a USB port. EscapeE supports most printer formats including HP™ PCL (including PCL3GUI inkjet), HPGL plotter, Postscript™, Epson™ and many others. Print data is spooled before reprocessing to any number of target electronic document or image formats including PDF, TIFF, JPEG and PNG. Part of the automation process can be used to extract index or key filing data from the printout. For example, XML format for adding to an EXCEL ™ database. Contact help@redtitan.com for pricing and reseller information.